Tiger Mya Wilson plots as she travels toward the goal and her teammates. Today, Feb. 6, the “Mighty Seven” Portola Tiger girls play perhaps the ‘bigg’est game of the season against league-leading Biggs Wolverines. Game time is 5 p.m. Biggs is 7-0 in the league and Portola girls are 7-1. Things are getting down to the wire with the final regular league games wrapping up this week. 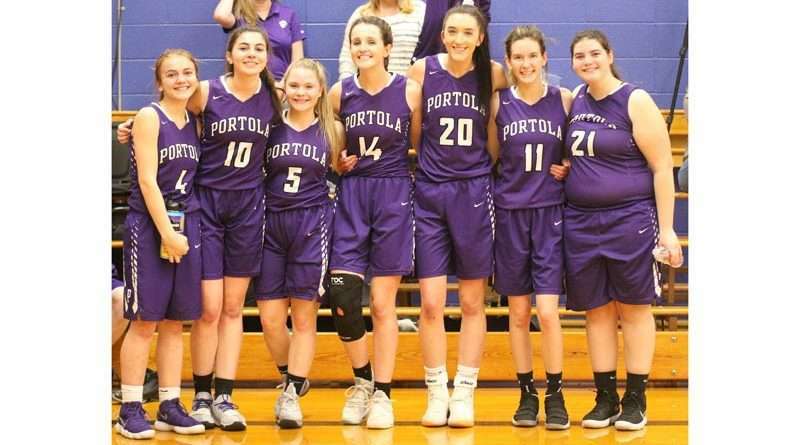 The last PHS league game is this Friday, Feb. 8, when the lady Tigers meet the Esparto Spartans on the court at 5 p.m. Playoff schedules are not yet up but are anticipated to begin Tuesday, Feb. 12, and continue Feb. 14 and Feb. 19. They will be posted in the Sports Section at PlumasNews.com as soon as they are published. 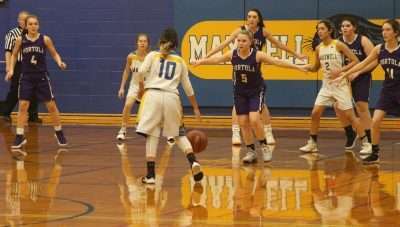 The lady Tigers were on a ferocious seven-game winning streak as they headed in to play the Greenville Indians Feb. 4. Tigers beat the Quincy Trojans on Feb. 1 in an exciting game that had the young Trojans in the lead in the first quarter, 15-12. But first place contenders Portola took over the game to finish 59-33. Leading the charge was junior Emily Sheridan with a 20-point game. sophomore Annie Folchi was right behind with 16 and senior Maddie Wilson scored 11. All Tigers scored, sophomore Mya Wilson, sophomore Abby Klemensrud and even injured senior Maddie Boyd. The Tigers were without senior Emilee Stewart that night. Trojan points were scored by freshman Lexi Baumgartner with 12, freshman Annie Froggatt with 9, freshman Emmary Wingfield with 7, and sophomore CoraGrace Hardee with QHS scoring 5 points. 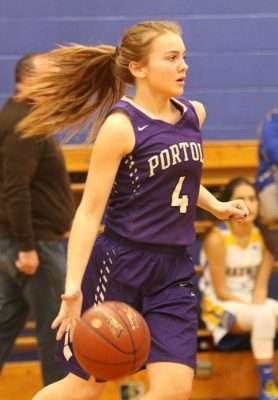 On Jan. 28, the Portola Tigers came out ahead of the CHS girls 68-34. Leading the Tiger roar was Annie Folchi with 17 points followed by Emily Sheridan with 11. Mya Wilson and Maddie Boyd tied with 10 points each and Maddie Boyd and Abby Klemensrud both scored 8. Emily Stewart added 4 points. Chester Volcanoes were led by senior Ashlyn Olah with 11 points and freshman Samantha Miller with 10. Junior Bailey Redican scored 5 and senior Lyric Quinn brought in 4 . Sophomore Jordan Smith and sophomore Chancey Juska each added 2 points. Tiger girls defend their territory against the Maxwell Panthers on Jan. 25 to win 50-25.